To determine the effect of laryngotracheal application of different doses of lidocaine spray on postoperative sore throat and hoarseness, we evaluated the incidence and severity of these complications in 168 ASA I–III patients aged 15–92 years in a placebo-controlled study. 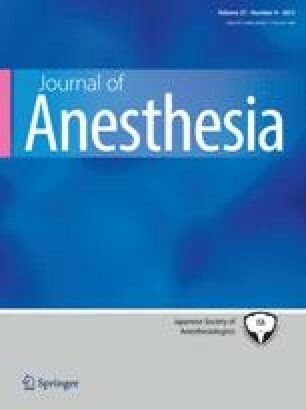 After induction of anesthesia with propofol, ketamine, fentanyl, and vecuronium, the laryngotracheal area was sprayed immediately before intubation with lidocaine spray either 5 times (L5 group, n = 47) or 10 times (L10 group, n = 48) or with normal saline 1 ml (placebo group, n = 51). Postoperative sore throat and hoarseness were evaluated immediately after surgery and on the day after surgery. The incidence of sore throat was significantly higher in the L10 group than in the placebo group on both the day of and the day after surgery. The severity of sore throat was significantly higher in the L5 and L10 groups than in the placebo group on the day of surgery. On the day after surgery, the severity of sore throat remained significantly higher in the L10 group than in the placebo group. Although the incidence and severity of sore throat increased in a dose-dependent manner, these were not significantly different between the L5 and L10 groups. In addition, the incidence and severity of hoarseness did not differ at all among the three groups. We recommend that applications of lidocaine spray to the laryngotracheal area should be avoided to help eliminate unnecessary postoperative sore throat, thereby leading to improvement in patient satisfaction.